The British Nun Club was founded in 1906, although there was a "Nun Club" in the late 1800's. Since its start the BNC has thrived with a good membership of between 30 and 60. At present the BNC has 30 members including several from overseas. Considering that up untill the late 1990's the Nun in the UK only had five standard colours compared with many other breeds, this is very good. 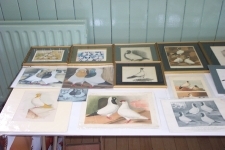 In the last few years there has been an influx of new colours from other countries, which opens up good possibilities for breeders to improve their birds and for showing opportunities. That said, as ever the black, dun and brown Nuns are the most popular because of the contrast in colour and them being nearer to the standard. Some other colours are though catching them up quickly in overall quality. 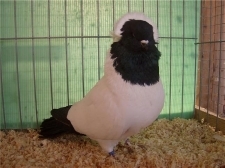 The BNC holds an Annual Club Show, which is usually held with the British Pigeon Show Society show at Pickering, North Yorkshire, where there are about 100 of the best Nuns in the country on display. 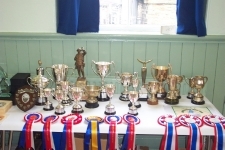 The BNC has 21 cups and trophies, plus replicas, plaques, specials and rosettes to be awarded at the club show, many donated by the members. There are also special cups awarded for Novices and Juniors. The AGM is also held with the club show and all prospective members are welcome to attend. The BNC also supports other Championship shows where possible with rosettes and sometimes trophies. New members to the BNC are very welcome and receive a full written standard and ideal drawing, club rules and colour newsletter. The newsletter usually has informative articles on Nuns, show results, photos and news from around the world, in fact anything that has to do with keeping and breeding Nuns past and present. The BNC has available enamelled lapel badges and cloth patches at £5.00 each and keyrings at £2.00 each. Anuual membership is £10.00 for adults and £1.00 for under 17's. For details on the history of the Hero`s trophy and it`s sculptor John Cassidy see below. Born in 1883 in Urmston, son of George and Elizabeth, he lists himself in 1911 as Shipping Merchant and 'employer' suggesting that he became a partner in his father's firm. He lived with his parents at Woodheys Grange until 1910 when he married Glasgow-born Marion Cowan and they moved into 'The Croft', on Harboro Road, not far away. Around 1914, they moved again, to 'The Manor House', picture below, a large Victorian mansion in Ashton-upon-Mersey, which perhaps offered more space for his pigeons. It was located close to Woodheys Grange, on the edge of what was they countryside. It is to be hoped that his pigeons never encountered the Woodheys Grange cats. He served as President of the British Nun Club from 1928 until his death in 1944. 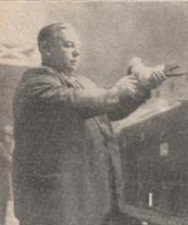 Our picture of him, from Pigeons and Pigeon World, November 10, 1931, shows him judging Nuns at the prestigious Crystal Palace show on 17th November 1931. The picture left, from the archives of the Manchester Academy of Fine Arts, shows The British Nun Club Heroes Trophy, created by John Cassidy. While browsing our collection of research material, the idea came to mind to 'Google' the British Nun Club to see if anything could be found about this interesting object. 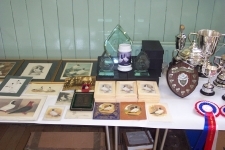 And not only is the the Club still flourishing, it has a comprehensive website, including a historical section, and the Secretary, Richard Henderson, sent helpful email replies to our enquiries, including the fact that the trophy still exists, and is still presented annually. 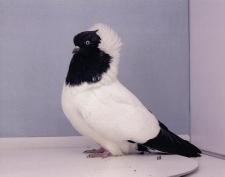 It measures 49cm to the top of the Nun pigeon, and the alabaster base is 16cm square, and the plaques are 13.5cm by 8.5cm. It also has copper plates on the base to engrave the winners names. 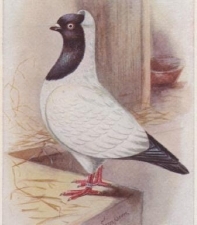 The figure is bronze, and the little nun pigeon is ivory. The bottom of the base of the bronze is signed by John Cassidy. 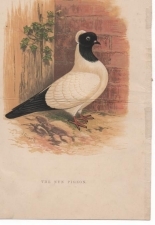 The Nun, a type of tumbler, is a very old breed of pigeon sharing a common ancestry with the Helmet and is mentioned in books like Treatise, and those by Moore and Aldrovandi dating back to the 1600s. During the mid-1800s the Nun became very popular in the UK and shows were well supported. This culminated in the first 'Nun Club' being established in 1888, with a Mr L.Millar of Eaton, Norwich as secretary, and the first written Nun standard being drawn up, although it is mentioned in the feathered World year book in 1911 that 'Kirton' laid down the first Nun standard more than 100 years ago. However by the early 1900s this club had ceased to function, although Nuns were still very popular with birds being shown at most shows. Because of this popularity and his enthusiasm for the breed, several leading Nun breeders were contacted by James Y. Baldwin from Bath, in early 1906, with the intention of forming a new club, The British Nun Club. A meeting was held in late 1906, with the first club show held the following year. At the 1920 club AGM held at the Birmingham show, it was decided to have a trophy commissioned to commemorate those club members who died and served during the war. With £7.12.6 (old money) in club funds, member J. Alan Walker stated that if this was made up to £10.00 he would match the same. The members present generously donated a further £14.00, therefore the sum of £31.12.6 was available to fund what was to be a unique trophy. Called 'The British Nun Club Heroes Trophy 1914-1919' it is a bronze figure of a WW1 soldier mounted on a solid marble base. The soldier has his arm outstretched and on his fist is mounted a carved ivory painted black Nun. 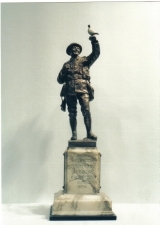 Around the time of the commission, Cassidy had created the model for a full-size war memorial which included the figure of a soldier, later commissioned by a number of towns for their memorial. He therefore had the research material already available, although the man on the trophy features a contented facial expression in contrast to that found on the large memorial figures. 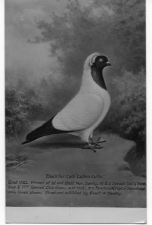 Pigeons were used to carry messages during the war, but the trophy does not represent such a scene, as the Nun is principally a 'show' breed and would not have been used for this purpose. 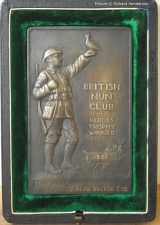 The money collected was sufficient to also commission six copies of a small bronze plaque for the winners to keep, and two of these are in the care of the Club secretary today, including the first one, presented at the December 1921 British Nun Club show which was awarded to J.Alan Walker, the major contributor to its purchase. Clearly these are also by Cassidy; they are certainly in his style. Mr Henderson mentioned that J.Alan Walker's address in Club records is 'The Manor, Ashton-upon-Mersey', a fact which threw light on a dark avenue of research into Cassidy's life and work. Census entries show that James Alan Walker was the son of George Harry Walker, a Manchester shipping merchant. We already knew that G.H. Walker commissioned and purchased other works by Cassidy, and appeared to have offered him space at his home, Woodheys Grange, on The Avenue in Ashton-upon-Mersey when the Lincoln Grove studio had to be demolished; now we can try to fill out the story.